This is How CoupCounts Membership Benefits Your Company. We are a network of local business owners and sales representatives interested in attracting new customers, increasing sales and profits utilizing the power of Online and Social Media Marketing for our companies. Member Only Discounts – As a member in good standing you are entitled to discounts other members provide on the products and services they offer. Example: You run a full-service restaurant and your son breaks the screen on his smart phone and you learn that it will cost $250 to replace the screen from manufacturer. Gain New Customers – Your business has an opportunity to offer products and services to other members not yet clients of your company or small business. Example: You run a dental practice specializing in orthodontia for children and you provide a 15% discount off your normal advertised rates to CoupCounts members. Your only advertising expense is a small transaction fee for each new customer. 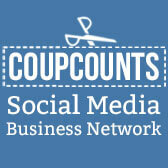 Viral Advertising Campaigns – You decide to run optional CoupCounts Swipe It Deals™ on your membership page. Powerful Online and Social Media Marketing Advertising Strategies – Learn how to utilize online and social media marketing strategies in your business to help your company Grow. Example: You want to learn the best ways to engage in the latest strategies for online and social media marketing to advertise your business. You login to your CoupCounts membership page or access our Private Forum Group on Facebook to study the most up to date techniques including real case studies on best practice marketing and advertising strategies. How Do I Join CoupCounts? Call Pathway Insurance at 513-662-7000 and speak with Jack Thomas or Colin Johnson to make inquiries. *The discount amounts offered vary by company as well as the amount and number of new sales volume and client acquisition. Results are not guaranteed. Examples used are hypothetical, not actual results. **CoupCounts does not accept membership from every type of business. Review the terms and conditions on CoupCounts.